How are your goals going for 2019? April is over halfway done and I'm able to check some things off. Co-Read a book with each kid - I read "The Great Brain" out loud to the middle and youngest on a car trip. That's 2/3 for sure. Bake something new - We didn't have to bake mochi, but we made this for the first time! 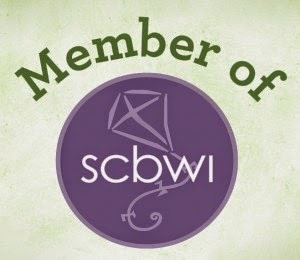 Write more for the educational publishing market - Signed a contract March 1, 2019! Continue to write for Highlights - Achieved in Feb 2019! 2019 Credit Union Cherry Blossom Ten Mile Run - DONE! 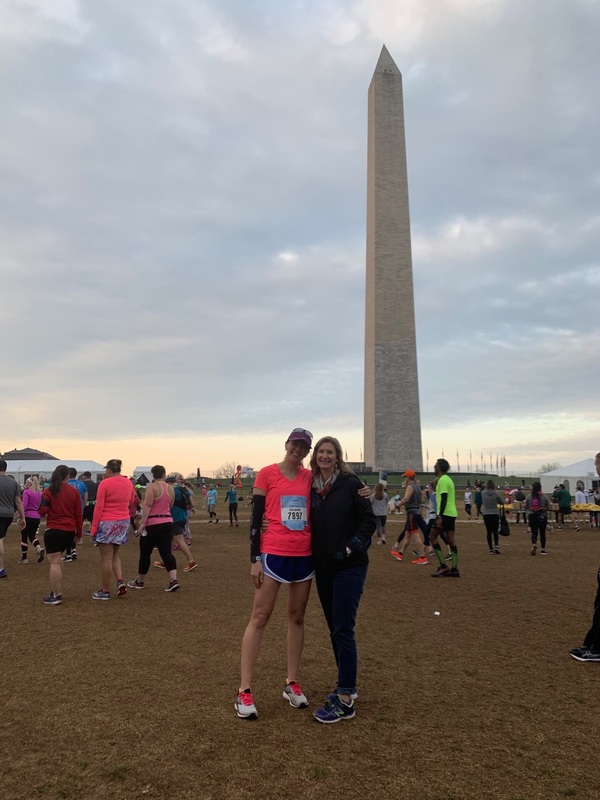 Another Credit Union Cherry Blossom Ten Mile Run is done! This was my ninth year and it was amazing in so many ways. My training was on track all winter and I was injury free. I only had one bad cold that kept me down for a few days. Race day was incredible. The trees were in bloom. The weather was 50 degrees at the start, no wind. This is me at the start waving at my friend. I'm still amazed she found me in the crowd! 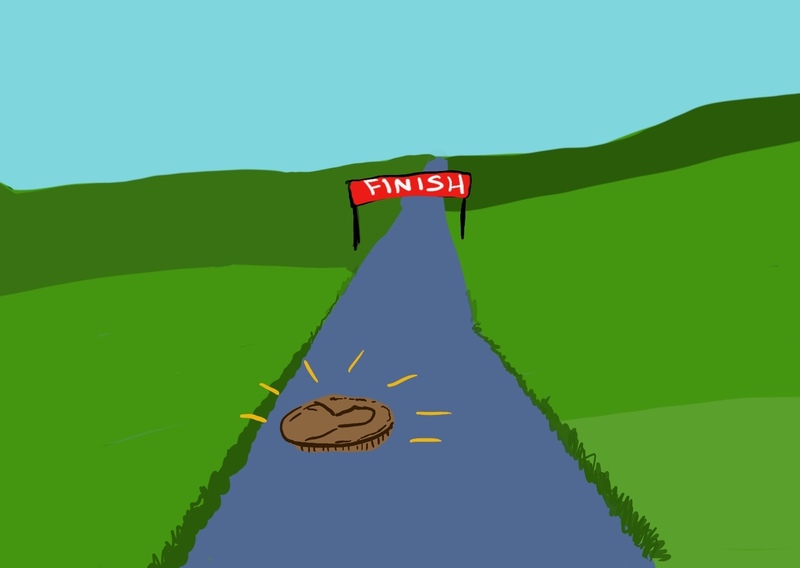 I exceeded my fundraising goal! I ran a pretty fast first six miles. I definitely struggled the last four and didn't go under 90 minutes like I hoped. That is such a frustrating mark for me. But I did crush the 95 minutes that I thought was going to be a tough goal. 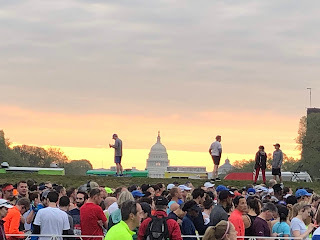 I finished in 91:08 and I'm telling myself to be proud. We were able to celebrate with a delicious Mexican meal after the race. 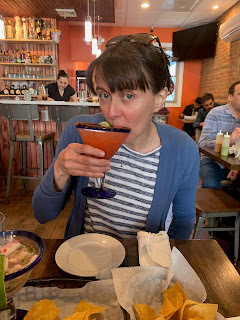 This strawberry margarita had a spicy sweet rim! Yowza! A few years back, my middle son was watching the Olympics on television. "What event is this?" I asked when I came into the room. "I don't know what it's called, but they are hitting each other with electric sticks," he said. "And I like it." You've probably already guessed he was watching fencing. 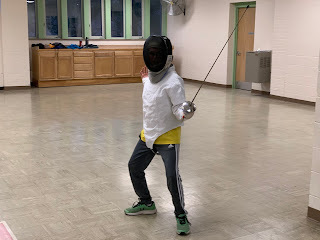 I admit I don't know much about the sport, but I do love pretending I do by shouting "EN GARDE!" and whipping my imaginary foil at my opponent. He wasn't begging us to try the sport, but he was interested. And he has a strong martial arts background which translates well to sports like this. But there wasn't a place close to us that taught fencing and our schedules are pretty busy. We wanted to give him the chance to at least learn about the sport. 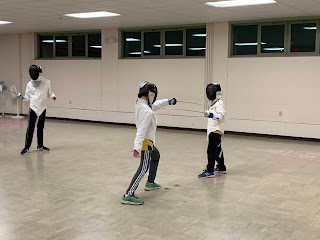 My husband signed up for an alert from a local fencing club and we got lucky. Really lucky. 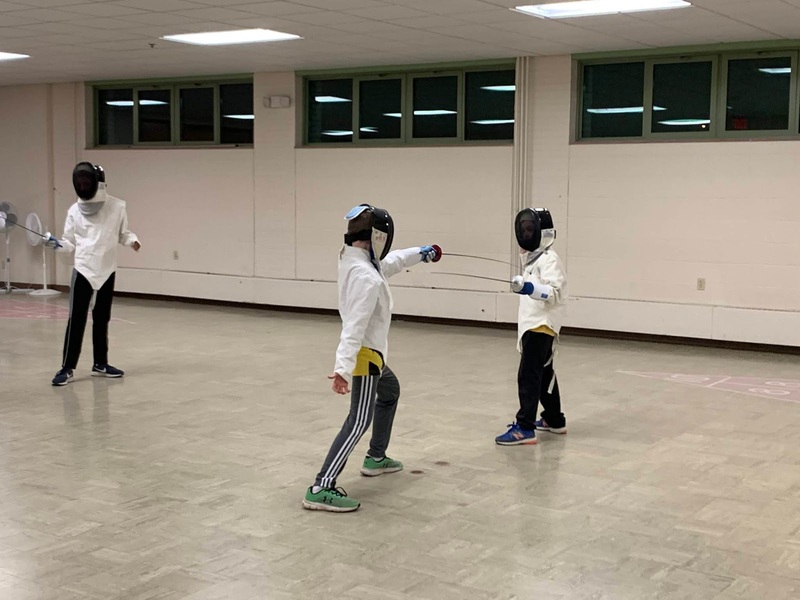 They had an intro to fencing course only a five minute drive from our house! It's really nice to only drive five minutes for a kid's activity. Soccer parents, I know you hear me. 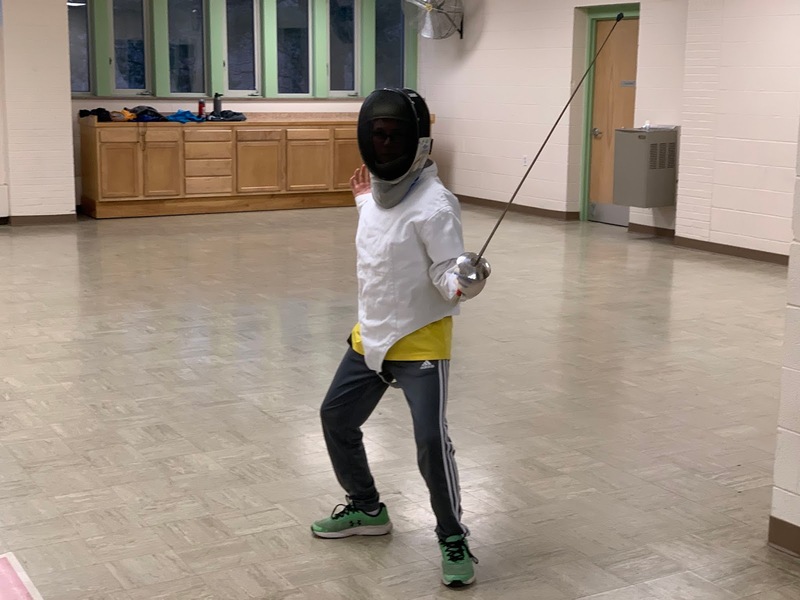 So for the past 6 weeks he's been learning a huge list of parry positions, new phrases, trying out pistol grip and comparing it to French grip, putting on equipment, and learning how to win bouts. That's right. He won his first bout. OH YEAH. EN GARDE! I'm checking in on my goals for 2019. My writing goals are chugging along, but I need to push myself in some other areas. For instance, baking. 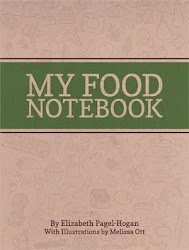 What new thing should I attempt to bake? A copper flash in the sun. Scoop it up, good luck is mine. 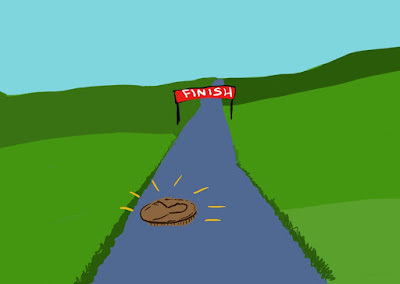 I'll make it to the finish line! 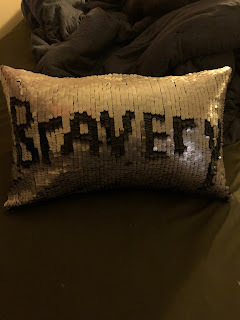 My oldest son picked "bravery" as his word for the year and I love it. It's kind of a family theme this year, I think. Bravery encompasses all kinds of behaviors that I respect and admire and appreciate. Bravery can be pushing yourself to work hard at a physical activity. It can be submitting to a new publication. It can be trying new foods. It can mean forgiving someone - like yourself. It can mean trusting someone - like yourself. My middle son exhibited some bravery over the holidays. He received a jigsaw puzzle as a gift and was uncertain about tackling it. He's struggled with puzzles before. They can be frustrating and difficult. I offered to trade him for it, but he decided to do it. I was so proud of his bravery. He also didn't want help. 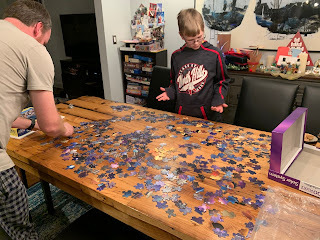 I was nervous about that, because sometimes he sets really lofty goals for himself, and doing a 500 piece puzzle all on your own is daunting. He eventually allowed us to sort pieces for him but not place any. 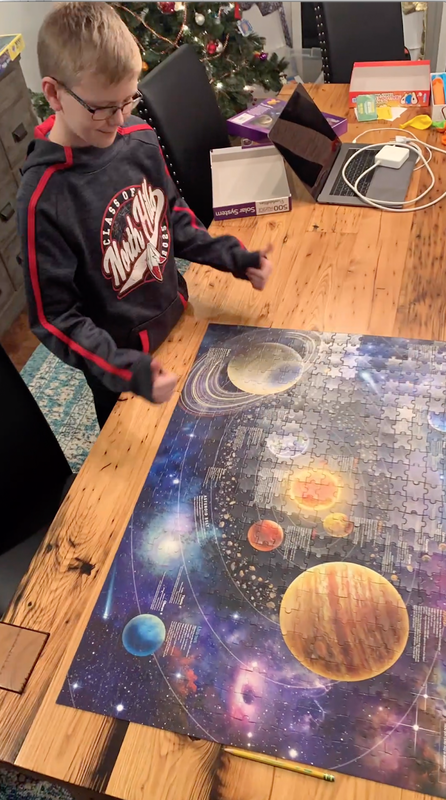 He tackled the puzzle his own way, too, much differently than I usually do puzzles. I stepped back and let him try it. I didn't need to worry. He did it. And his feeling of accomplishment was as big as the solar system. It's always a good time to try new things. But what about trying things that you haven't done in maybe 30 years? Do they count as new? 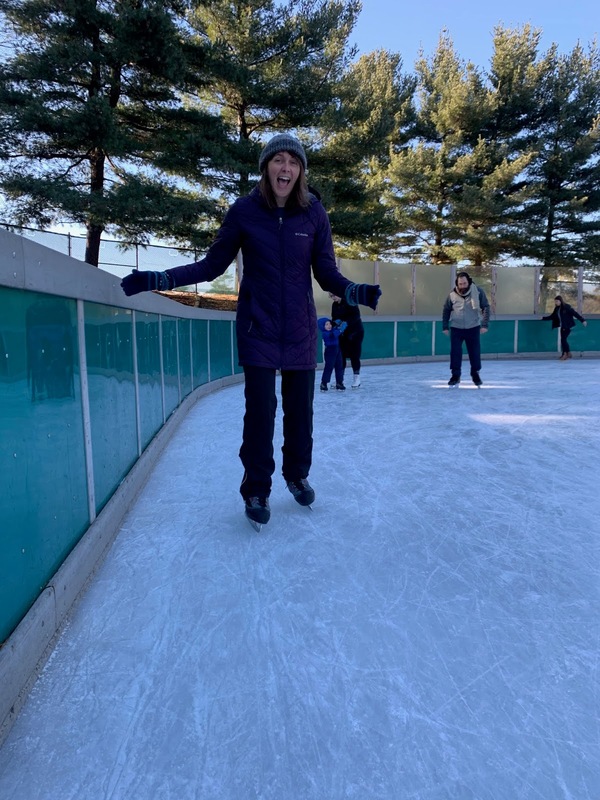 During the holiday break, I spontaneously decided to ice skating. 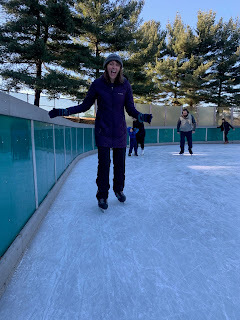 I hadn't ice skated in about 30 years. I was never any good at it before and I was nervous about doing it, but thanks to help from two friends, I completed one loop around the ice. I felt proud and energized. I do make new year's resolutions but I also like to review my goals for the year. It's taken me about a month to refine my goals. At first I made a big list of everything I wanted to have happen this year. Then I realized there were some things on my list that I might not reach no matter how hard and how smart I worked. After a second look, I realized there were some things on there that couldn't really be measured as "done" or "good." They were just too subjective or ongoing.